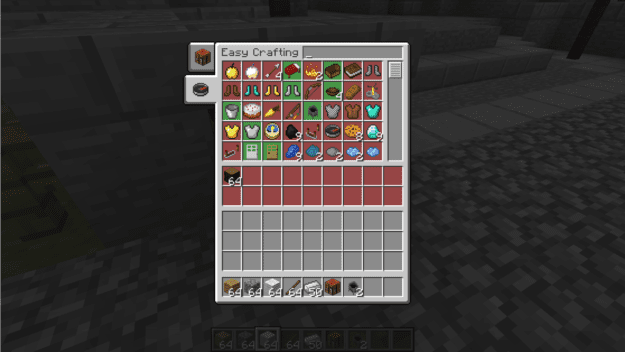 The Easy Crafting Mod is a simple crafting table tweak that streamlines your crafting experience. It puts a simple GUI together to automate any recipe that can be made with what’s available in your inventory. The mod is available for the latest patch of Minecraft 1.7.10 but also works with Minecraft 1.8. The mod can be installed for Minecraft servers SMP but also for single player client. To use the mod, you first of all need to install the mod with the help of Minecraft Forge. Then you can simply load up your latest Minecraft game and enjoy its features automatically. There is currently no public video showcase for the Easy Crafting Mod. All you need to do for this mod to work is have craftable items in your inventory when you open the table. You’ll see a set of items load in the top portion that shows you what can be made with your items. And then all you need to do is grab as many as you need or can make. It also functions as a storage system for items you don’t want to include in your crafts. Just put them in the middle red section and they’ll be omitted from your available options. The mod is available for the latest patch of Minecraft 1.8, SMP and Client. First of all, you need to download and install the latest version of Minecraft Forge. Download Minecraft Forge for Minecraft 1.8 by clicking on this bullet point. Next, download the Easy Crafting Mod and drag and drop it into the .minecraft/mods folder of your Minecraft directory. Launch Minecraft and enjoy your new mod! The latest update for the Easy Crafting Mod ported the entire mod to Minecraft 1.7.10, it also works with 1.8.